Need to purchase Blue Devil Tickets?? THANKS FOR THOSE WHO PLAYED LAST YEAR! A community-wide pep rally for our Blue Devils will be held at Brodie Field on Thursday, November 9th from 6:00 PM-7:00 PM. The entire community is invited to come out to the home side of the stadium and help us cheer for our Blue Devils as they enter the first round of the state play-offs. Your Blue Devils are ranked 6th in Georgia's highest classification, 7A. Congratulations, coaches and players! Go Big Blue! 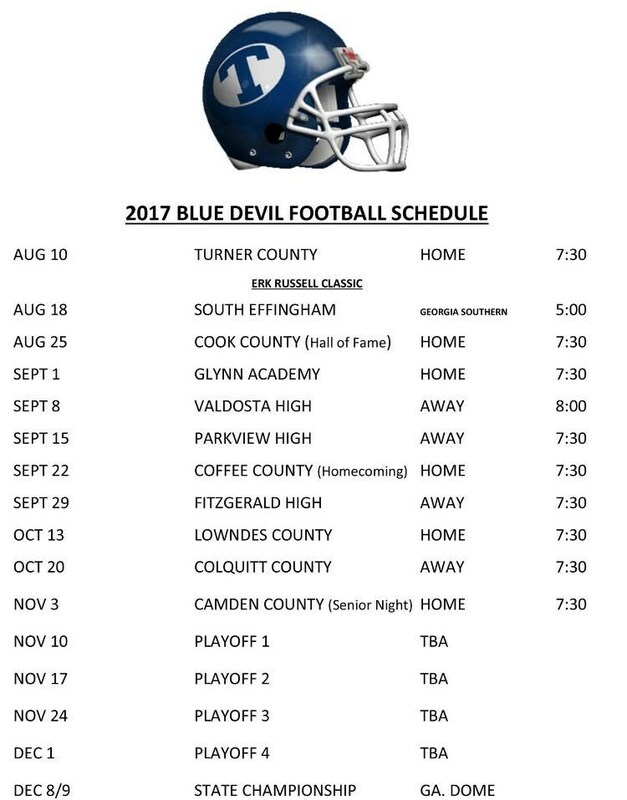 Come out and support our Blue Devil's and listen to Coach Anders talk about this upcoming football season! The team that has the most fans will receive $250 that will go to the booster club!! We won this last year! Also, they will have a guest speaker that will be talking about concussions. Hope to see you all July 29. Go Blue! See more details below! GO BIG BLUE! GO BIG BLUE! GO BIG BLUE! The Blue Devils will be hosting their annual Water Bowl at the mini-stadium at the high school on Friday, May 5th at 6pm. Admission is one case of bottled water and the game will be a practice format/situational scrimmage.